The S.A.L.T. 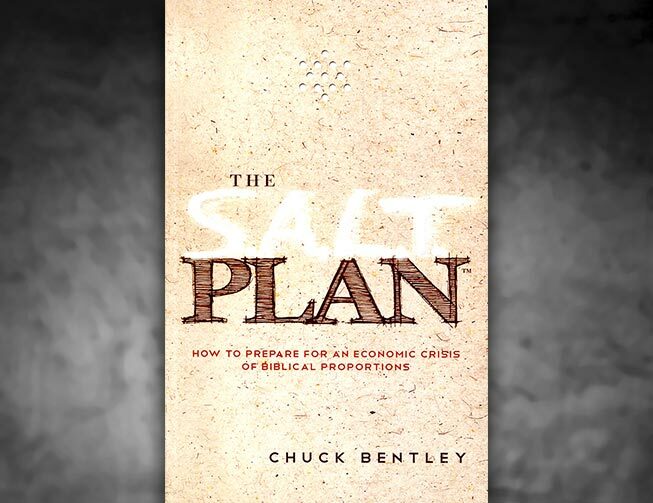 Plan is a culmination of principles compiled into a practical guide that provides both biblical wisdom and sound advice to help you carefully plan for hard times, while continuing to be faithful with your God-given resources. The Enemy will never waste a good crisis, so neither should we as God’s people. We can turn everyday adversity into advantage by loving others and leading them into God’s Kingdom during their time of need. The signs are around us everyday. We are truly in times of economic hardship, and some would even say that we are hinging on an economic event of biblical proportions. The idea of preparing for hardship is a timeless concept. How can you protect your family in the midst of financial crisis? God’s Word provides proven principles for preparing you to do well in any economic situation. Are you ready to commit to being salt and light in a darkening world? Note: The strongest nations are losing themselves to debt and so are many of their people. If we avoid debt and look for a solid foundation, a revival can happen on top of that – we are past an easy and simple recovery. Notes: There are four identified possibilities for the future from total collapse of our government to a worldwide unification of countries. We don’t know what is going to happen, but as Christians we have the Bible to show us how to act in the mean time. Notes: God may use economic crises to bring us back to him or test our faith – we need to be prepared so that we will be ready to answer God and also, so we can be ready to help others. Notes: We need to understand that God is jealous – he is jealous for our love. He created us so he should get our worship. He is so willing and able to help us whenever we ask – but so often we turn to other alternatives. Notes: God can do anything. He can see and predict the future, he can cause huge armies to flee at the sound of footsteps, He can bring about his justice here on earth. Why would we try to trust in ourselves, when it is so much more profitable to trust in God? Notes: The early church was not supported by small tithes; it was supported by the sale of assets and the whole gift of the profits. We have to be prepared to put a greater value in the Kingdom than on material possessions (pg. 62). No matter what was thrown at the early church whether it be persecution or famine, they stood up to it… together. Notes: It takes a lot to share with others when you yourself are suffering. However, God is in control and we can trust him no matter what, Therefore we can be generous. There is no point in trusting in anything else – everything else will fail us. Notes: This chapter gave a simple over view of the SALT plan as a whole and also included a lot of great metaphors to understand the importance of having a plan. Life is so unpredictable and as with storms, those that are prepared will be able to survive as well as help those around. That is what we are called to as the church. Notes: In Chapter 9 the author discusses the importance of saving. Not only is this financially responsible but it will allow you to be the church in times of struggle and allow you to give to those around you. In Joseph’s life he used his power in the government to save for the people of Egypt. We are not to rely on our government but instead save individually so that we may give. Quote: “A family business is also a great way to provide multiple incomes. Consider starting a small business on the side to involve your spouse and children. You can work your regular job by day, and become an entrepreneur by night. For the best Christian advice on setting up a home-based business, you can’t do better than Wade Myers. Explore all of his resources at Crown.org. Quote: (talking about being prepared for a literal natural disaster) “Your goal is to have a months worth of provisions for your household. Once you’ve achieved that, continue to build on these resources so that you have a surplus to share with others. That, after all, is what the SALT Plan is all about. Notes: This Chapter is about handling the assets you are blessed with, in an appropriate and biblical manner. God told parables of servants that invested their talents and multiplied them, they were the ones that were blessed, not the one who buried it and returned the one single talent. We are to grow what we have so that we may give. Notes: This chapter on liquidity is about the importance of being flexible with your finances, both liquid and “solid”. Having liquidity in our lives gives us the ability to follow God’s call in an instant and does not trap us with assets we cannot use. Notes: This chapter emphasizes 7 biblical truths regarding moving forward in preparation for an economic event of biblical proportions that prepare us for circumstances in this life. This is the final chapter of the book and it ends with Truth. We are called to be honest in all of our dealings.